i have 2 computers with sandboxie and chrome for years, today chrome got updated to 28 on both computers. opening chrome without sandboxie, it loads the style as it should. all cache has been removed from the original chrome, no cookies or any old data. everything is fresh, both computer has the same sandbug. hope you get it fixed, its not an urgent issue, just annoying abit. It also effects the scroll from the left/right (depents on your system's language). How do I try this for Chrome on XP? I don't know what is meant by "select TAG (html code)". no lol i didn't mean select tag.. i meant <select> in html coding doesn't have the desired style with sandboxie. you can't select it, just to go a website that uses that code inside the HTML or look to your left/right and see that your scroll for the page has Win2000 style. 2 different machines, XP + Win7 - works fine without sandboxie, the bug is only with the sandboxie from chrome ver.28. 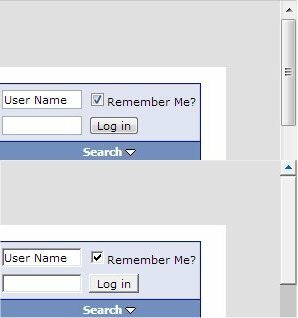 When chrome is sandboxed the scrollbars and other parts of a website change a bit...for example look closely at the image below, scrollbars and login button change...why is this happening? "Visual styles" aren't being applied in the sandbox, I guess with the latest Chrome version...? sometimes, not often but it still happens from chrome 28, you get a "chrome.exe read error" which cause the page to not being loaded, ctrl+r will reload and the that's it. but it will happen from time to time, yet another bug with sandboxie+chrome 28.
this is the third bug already. when youtube pages load, not only youtube but usually youtube, you see for 2-3 seconds a Ruler on top of the screen, beyond the favorites shortcuts. This will be fixed in the next beta version I release. I don't know what changed in Chrome to cause this problem but in version 28 it seems the Visual Styles DLL is not loading into the sandboxed Chrome. Loading it explicitly seem to fix the problem.